“Flo-Jo of the Pool” cuts a dash at carnival! Do you remember Florence Joyner? She was a US athletics star of the 1980’s. Part of her fame was her long painted fingernails and figure-hugging flamboyant athletics outfits. She favoured fluro and bright colours, one-legged leggings (ie- one leg bare), big hair, hooded leotards and bold jewellery. It goes without saying that you need to be top of your game to get away with wearing outrageous outfits. It’s no good getting all dressed up and then not winning -everyone will think you spent all your training time in front of a mirror working on your outfit. Florence become one of the fastest competitive runners of the 1980s and although she was suspected of using steroids, she denied the claims and never failed a drug test. Maybe her performance enhancing substance was plain and printed lycra! I do not have Florence’s athletic body or long nails, in fact I am nothing like her, but she was on my mind as I sewed an outfit to wear in the “parents and staff” relay race at last week’s school swimming carnival. 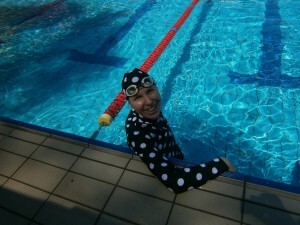 I haven’t swum a race in about 20 years, but I thought it would be fun. I used black and white spotty nylon lycra from Spotlight to make a long sleeved rash top and matching 3/4 leggings (with two legs not one). It took exactly 1.40m. Here’s the whole ensemble, moments after the elastic on my 20 year old goggles broke. For the leggings I used a pattern I already had, and just cut them below the knee. For the top I adapted a pattern for a long sleeved t-shirt, adding a neckband and taking in the sleeves and body (to eliminate drag in the pool, of course). I cut the armhole fairly high. 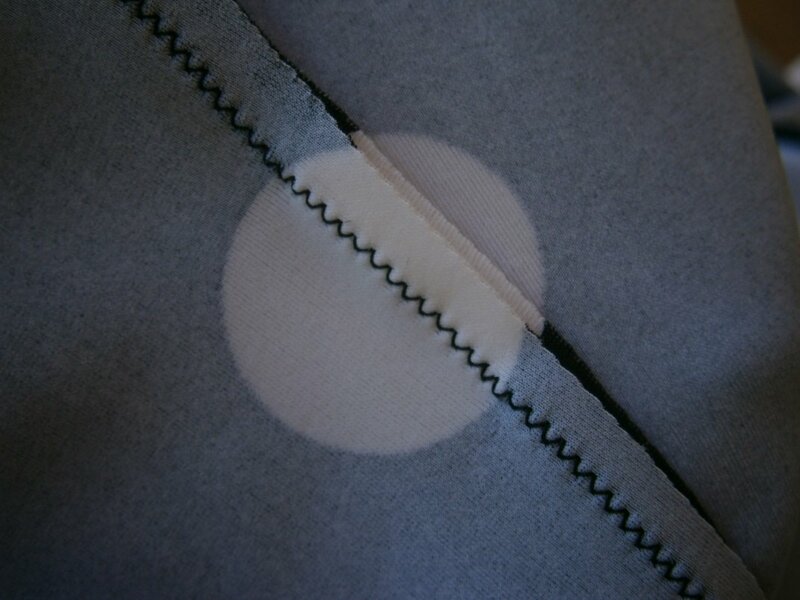 A good way to check the fit of stretch garments is to sew them using a long straight stitch on the machine with a stretch needle and matching thread. I did this for the top. After fitting and adjusting, the long stitch can be sewn over the top of or easily pulled out. I sewed the whole thing using a small zig zag on my regular machine, matching the spots of course! 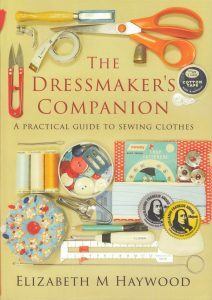 I do have a 4-thread overlocker, but I’m not confident it has the holding power for such stretchy swimwear. 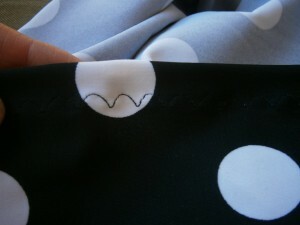 I used a scalloped stitch that stretches for all the hems; you can only see it when it crosses a white spot. 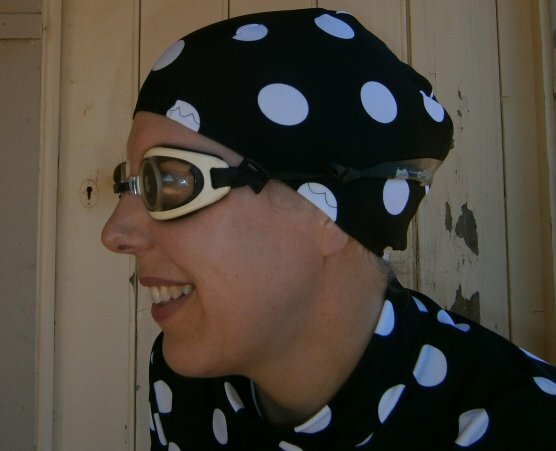 To finish my outfit I made a matching bathing cap. The pattern is two half circles with a central gusset. The day of the race dawned HOT. We brought hats and plenty of water with us, and lowered our children into vats of sunscreen. The relay race was at the end of the day -four teams of six parents and one of staff thrashed it out for glory. In the shallow end waiting for my turn at the relay, hoping all my lycra will enhance my performance. Note new elastic on goggles.